Did you know that 90% of your donations go directly to services that support vulnerable women and children in the Downtown Eastside? The Downtown Eastside Women’s Centre is a registered charity: Charitable Registration #12989 5959 RR0001. Tax receipts are available for donations of $10 or more. Read about our Signature Sponsorship Opportunities for examples of your donation’s tangible impact. I would like to make an online donation. I would like to make a donation by mail. I would like to donate goods. The PayPal Giving Fund is a charitable foundation, dispensing donations to charities without charging fees. Give through the PayPal Giving Fund. Canada Helps is an online giving platform that charges a small administrative fee in order to facilitate donations to charities across Canada. Give through Canada Helps. CHIMP is a Vancouver-based organization and online platform which facilitates online giving. Give through CHIMP. Benevity is a B-corp and online platform that streamlines the process of corporate giving to charities and non-profits. Give through Benevity. Your tax-deductible donation makes a difference to the lives of women and children, and makes a great holiday, birthday and anniversary gift. Tribute options are available via online donation or by mail – simply fill out the portion of our donation form under “Tribute Gifts,” and attach to your donation. 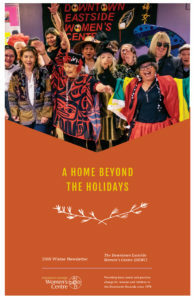 By leaving a gift to The Downtown Eastside Women’s Centre in your will or estate plan, you will contribute to a lasting legacy for future generations of women and children. A planned gift is tax-wise and can help you and your family achieve your charitable and estate planning objectives. For more general information about planned giving, please contact us.